Concentrated - Makes 640 gallons. That's only $0.21 Per Gallon! 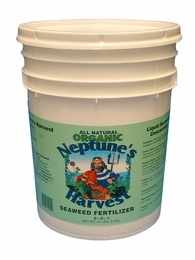 Neptune's Harvest Seaweed Plant Food is an organic storehouse of over 60 naturally occurring major and minor nutrients and amino acids. Its growth promoting substances (Auxims, Cytokinins, Gibberellins) enhance plant development, color and vigor. Seaweed has also been found to increase plant hardiness and resistance to adverse environmental conditions, such as early frost, extreme heat and lack of moisture. Used as a seed inoculant, seaweed fertilizer increases and accelerates germination, and enhances the rapid development of a healthy root system. Seaweed is an excellent addition to any fertilization program.